Want all the Killer goodness in a go? No problem! 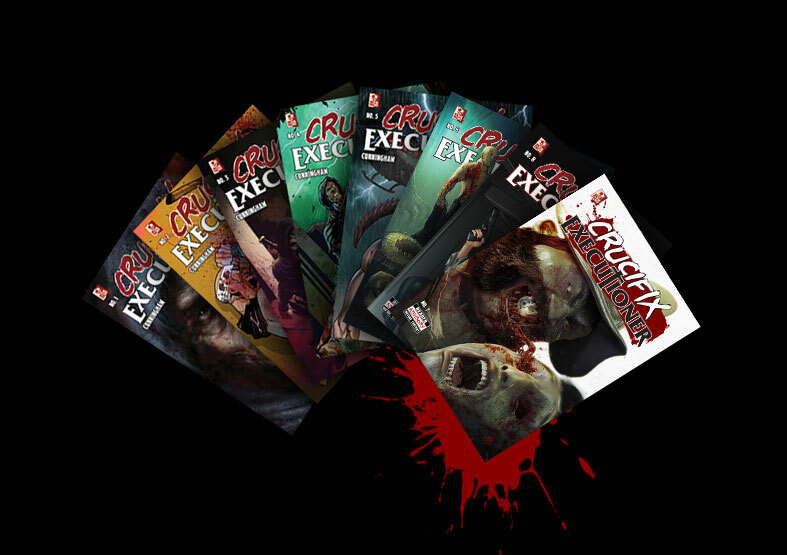 Get all 8 issues of Crucifix Executioner for a discounted price and don’t miss-out on the action. Each individual copy costs $1.99 each, but you can get the whole saga of the Crucifix Executioner for only $9.99 and save $5.93! Description: Brought up in another city ravaged by pestilence, local psychic Glen Parsons, is no tranger to crime but when his beautiful wife is brutally murdered and he is left seriously wounded; something snaps. Detective Lance Steel is a dirty cop whom uses the badge to exploit the innocent and corrupt. He soon crosses paths with Glen and finds himself battling the xenophobic young man’s furor. As more and more bodies show up bearing Glen’s mark, a relentless criminal investigation is unleashed, entangling Steel and everyone around him. The gift of foresight was once a tool Glen used to help the desperate, but now with a haywire brain, the line between good and evil, sanity and insanity, blur in a crescendo of blood-splattered violence. WANT YOUR COMIC PRINTED? NO PROBLEM! YOU CAN PURCHASE A PRINTED VERSION FOR $4.99 each HERE!